This entry was posted in Kawai R100. Bookmark the permalink. I’m stupid excited about this. Thanks for putting it together! I’ll definitely be buying a couple boards from you. Unfortunately I’m a Mac user though :/ I don’t expect a Mac version of the software but it would be awesome if you could post a thorough how-to for those of us who are Windows ignorant delving into Parallels, et al. My main question is (and has always been): What EPROM burner do I need to burn the custom chips? And which chips? Anyway, really looking forward to playing around with this. The R-100 is king of vintage digital drum boxes in my opinion. Custom ROMs will take it to a whole new level. Thanks. I am a follower of your blog as well (and a JX3p user too). I don’t have any Mac experience, but I have at least one guy in Sweden using the software on a Mac so I know it works. You will probably have to ask some Mac people for help there. The preferred chip is 27C400 though I think there are other chips that are equivalent but as I’ve never used them I’ll refrain from mentioning their names for now. They are made by ST Micro, AMD and others. So that would be what you would look for in a burner. I have two burners, Galep-5 by Conitec and a SuperPro-600P. The Galep is a nightmare on Windows8 so that’s why I bought the Xeltek. There are definitely cheaper models as those are each about $600USD. I’d love to burn some sounds for my kawai. I use a TOP853 eprom programmer. so i can just burn bin files to eproms an et voila? Assuming the programmer will program the EPROMs you buy, then yes! I use AMD 27C400’s but there are some other names/numbers for this format as well. The 27C400 is 4 Mbit (512Kb x8 or 256Kb x16 selectable by one pin) and the Kawai R-50/R-100 use the 256k x 16 arrangement. Just check the pinout versus the 27C400 and you should be OK.
Hi, maybe i am blind but i don’t see link for software download, plase write post or mail me. I just want try it, thanks much for reply. The HR16 Editor by Dustin Licis you mention, is that on the web somewere? I can’t find it. There is also a new one and another old one. I think both of these are mentioned on Burnkit2600.com, although maybe they only mention the old one. They are up on eBay all the time. I got mine off Craigslist locally for $50! There were a few minor issues with it. My Pro One was only $300 but I had to drive a way into the countryside to get it and it needed some repairs. Also through Craigslist. A little information on the R-50 family, which uses the same sound ROMs as the R-100. As far as I can tell, the R-50 family consists of the R-50, R-50e and R-50iii. The last one being a unit that has all 3 ROMs in it, just like an R-100 would with my ROM switcher installed. One curiosity about the R-50 is that although it has the same 24 sound samples in the EPROM, it only has 10 pads on the front panel. The R-100 has 8 pads setup in 3 selectable banks. So what the R-50 has done is allowed for Preset and User Pad Setups (or drum kits if you prefer). What I had never seen until recently is that Kawai supplied plastic overlays for some of the preset kits. You can see them rarely in pictures of the R50. They say “PADS INSTRUCTION OVERLAY PRESET1/PRESET2” and the names for the drums in those kits. I’ve only ever seen this one, so perhaps the other presets are printed on the back. Regarding changing an R50< -->R50e I think this would be pretty easy. You’d have to swap both the sound rom and the OS rom so that the menus matches the sounds. Finally here is a guy that sampled a bunch of the sounds. Again, it’s the same sounds as a loaded R-100. The R-50 also has built in effects so you have to watch out for that when comparing to an R-100. I recently picked up an R-50III, but I am having a problem when loading kit 2, the machine just glitches out and will not boot. 1 and 3 are fine. Does anyone know if it is possible to find the eprom data for the III and burn a new chip? It’s probably the OS eprom if it doesn’t boot. I think if it was the sound ROM (well, one of them), you would just get crap on the outputs. OK, so I can try to burn that Eprom. Do you know which chip it takes? You have the OS for the III? So I finally got around to burning some EPROMs (uh, 4 years later). I loved my R-100s to pieces before but this brings you into a new dungeon of menacing sounds to play with. The new samples sound really good, way better than, say, custom HR-16 ROMs, which tend to be fiddly and noisy. I burned some 303 and synth samples into the longer slots (ride & crash). Those samples in combo with the DAC bends are just brutal–endless fun. Of course drum samples sound awesome too. 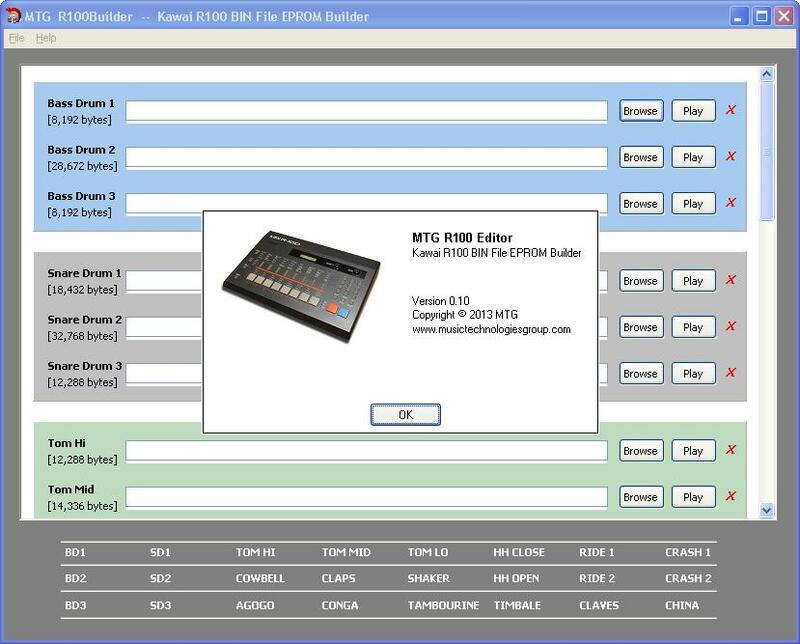 @grantb4/MTG – Thanks 100 for putting the R-100 Builder software out there for free. I sent you an e-mail. Please, could you post a valid link for download your software MTG ?